We arrived to Latrar at 1am. Compare to what we have paddled through the bay was calm. It went darker for few moments, but already the light was coming back again. There were houses scattered on both sides of the large bay of Adalvik, we opted for the more sheltered side, called Latravík. 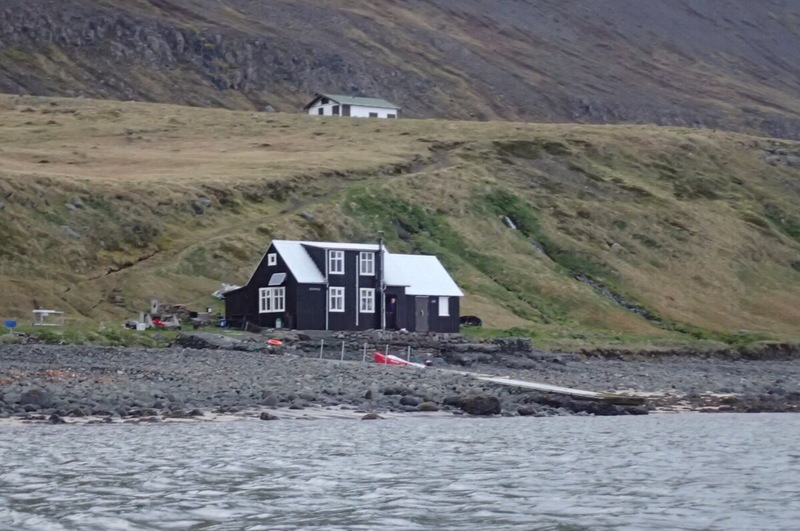 We were told that in this part of West fjords we are unlikely to see many people, as all of the houses here are summer houses and it is still quite early. The next morning we decided to explore the place better. We walked to where the school once stood. As before, people have indeed lived here, benefitting from the sheltered bay for fishing and farming. However they have left the place in 1952 as life was really harsh. After that, the only people inhabiting this place were the Americans. 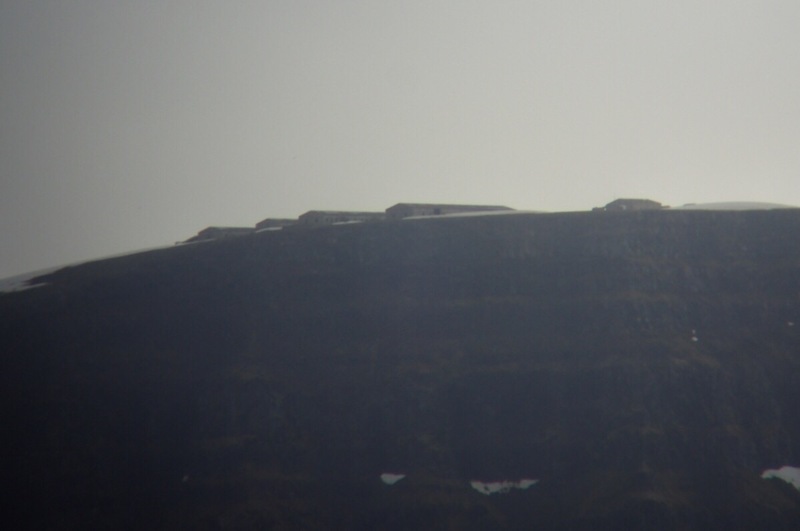 They decided to build an Air Defence Radar station on top of the mountain Straumness in the 1953. First troops arrived in 1956 with the station starting to fulfil its function in 1958, however it lasted only for two and half years as it was too expensive to operate. I guess the nature was not very happy with such structure and tried to dismantle it as much as possible. The old records talk about “Old Friend Gust” throwing stuff around a lifting people of thir feet. We have climbed the mountain in order to catch some signal, and the place didn’t look very welcoming to human beings. Anyway, continuing with our explorational walk, we have ventured back down to the water, and there we found some human life. First it was a man painting a side of a shed. We exchanged few words, he in Icelandic, we in English before we parted our ways. Then, as soon as we left him, we came across another man standing next to his house right on the small quay. Here, we exchanged few more words, and we got invited to have coffee. We don’t know much Icelandic yet, but we understand the important key words. Inside the house were yet more people. And so we found out that these three brothers were here on holidays in what used to be their grandparents and parents’ house. When we established who is who, and how did we get there, we were invited to stay with them for few days. As the descendant from Old Friend Gust will be loose for few more days. 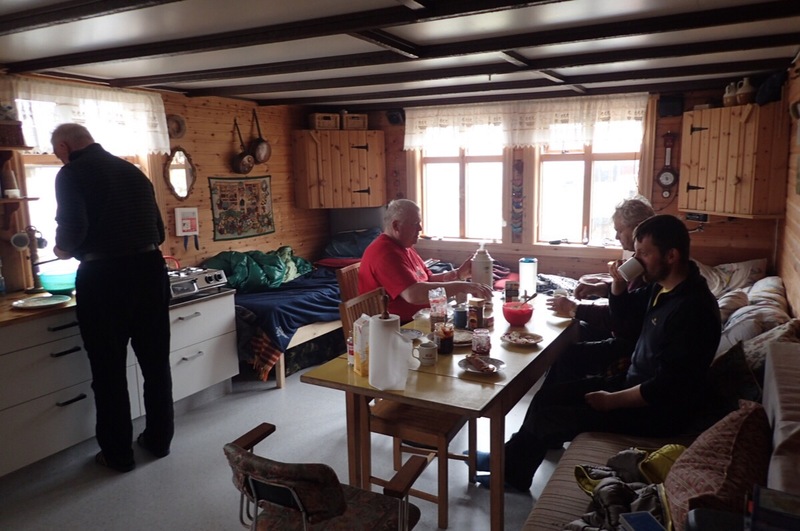 We would like to thank to Frederic, Inky and Gunnar, who invited us in the warmth and dry of their house, and shared their meals with us. We spent the five following days playing cards, walking around in the gales, eating pancakes and waffles, potatoes and fish. I have to admit, that when we were offered the sheep’s heads, we kindly declined. We drank lots of coffee and listened to Icelandic radio. Only the weather wasn’t getting any better. We knew, as every time the weather forecast went, Frederic looked at us and started laughing. Then came Saturday, the day that Frederic was due to leave, and the time came for us to move out and back into the rescue hut. The boat arrived quite early in the morning and with it a lot of people and equipment, which was unloaded fairly close to our end of the beach. Someone would be repairing their summer house. The boat came once more, the bay started to fill with summer house owners for the weekend. The weather has also calmed enough, that we made a plan to leave that night. And good decision we made as later in the day, some walkers appeared, also wanting to stay in the hut. Yes, it was time to go, so as they were settling for a night sleep, we started to pack. By half past ten we were ready. As soon as we sat in the boat, I realised that my rudder wasn’t working. So we were delayed by small repair. Finally we were leaving. Earlier we went to bit our good byes to people in the house, and it was heartwarming to see Gunnar standing in the doorway, waving us off as we paddled past. Then, we were on our own, with the deserted wilderness in front of us. 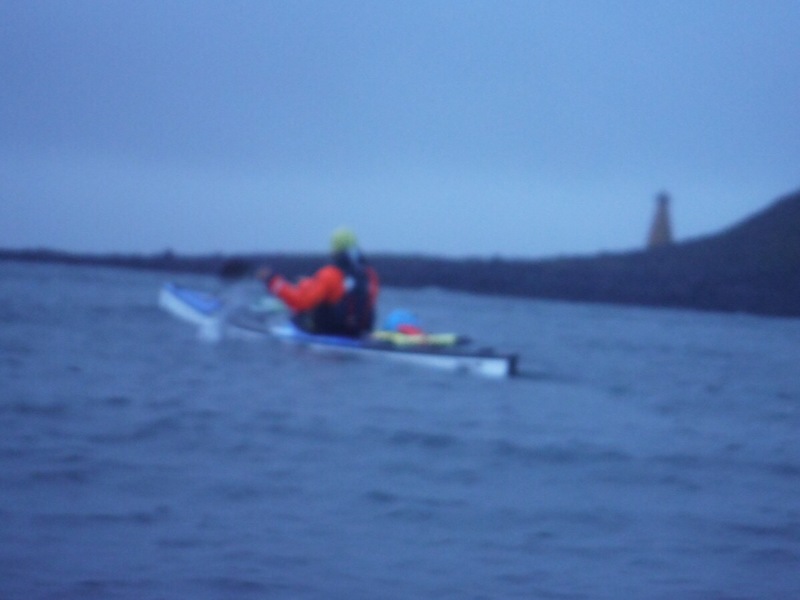 The main challenge of our paddle that day was the point of Straumnes. The most northerly point of West Fjords and place where currents meet. Earlier in the day the offshore buoy was showing 3.2 metres waves. We were hoping that that would have calmed down a bit by now, and that we could to sneak by closer to the shore. I won’t be going into much details of our paddle here. Let’s just say that the sea was the biggest we’ve been in so far, with fairly steep waves coming fast to us as we battled against the head wind. Because of course as soon as we left the calmness of the bay and came to the end of the headland, the wind came in full force. We paddled hard for three hours, slowly making progress. 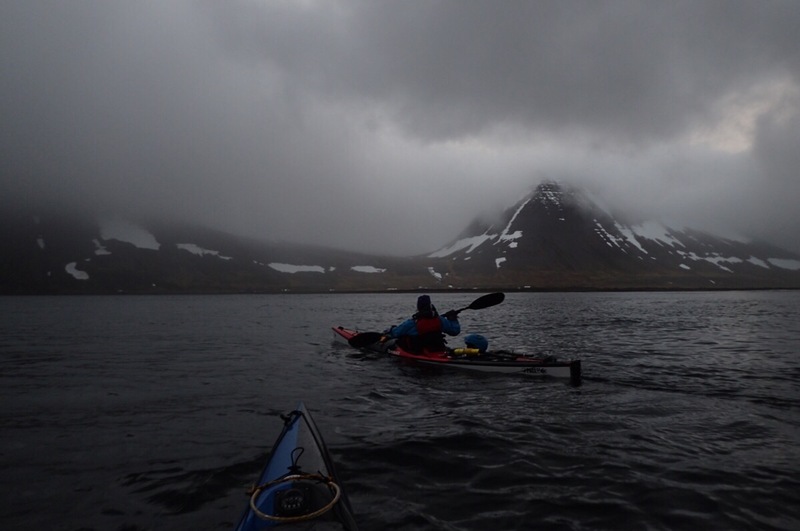 When we started paddling, we were hoping for such conditions to allow us to make reasonable progress and cover some considerable distance. 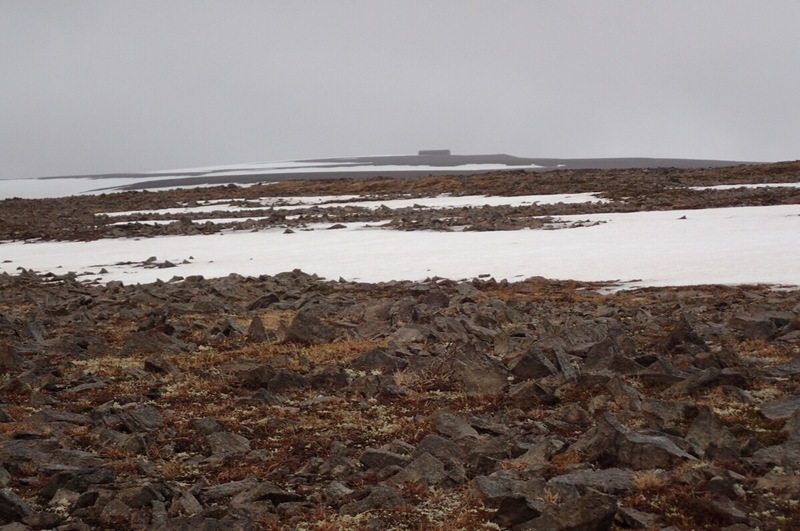 Now, we were only aiming to the next closest bay, and another emergency hut, in Fljótavik. The plan changed to get rest for few hours, and try to continue later. 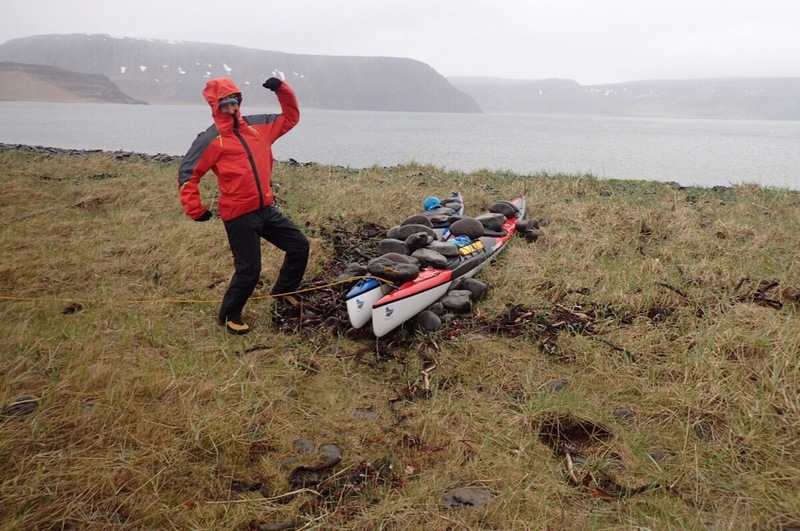 We landed at 3.30am, and I decided that by 4am, I would be sleeping, by 8am getting up and 9am, we will be paddling again. We managed to keep this plan, and woke up into reasonably calm morning. The paddle out of the bay was great, we went through some rocks and woke few seals. Then the headland came, and the wind, and the wild sea. It took us ten minutes to make the decision to go back. It would only get worst as the cliffs proceed, and it is a long way to the next landing place. And so, we turned and came back to Fljótavik. The day would now be spent eating, sleeping, exploring and contemplating when would be the next best time to paddle. We made a cup of coffee and sat outside the hut. The doorway sheltered us from the wind, but the air outside was fresher than the stale musty one inside. After a while just as we were finishing the cup, the telly was turned on. Today’s program was to be a short sketch of the life of a hiker. Two silhouettes, which reminded us of the two walkers from yesterday, appeared. They were getting ready to cross a fairly wide river mouth across the bay from us. We made second cup of coffee to go along with the program. Fortunately, just when Michal started to think that he would have to put his drysuit back on and go and save them from the middle of the current or sea, they gave up and walked away from our sight. Then in few moments, a boat appeared and quickly made its way across the bay. Talk about deserted places and no people early in the season. It moored close to our side of the bay. We made a third cup of coffee and decided to watch how they will fare the offloading and disembarking in the strong wind. It didn’t go really well, so after the first round, they decided not to use sandy end of the beach closer to houses, but off load right in front of us as it was a short and more sheltered ride in the dingy. And my, was there lots of stuff. As we didn’t fancy any more coffee, and this was happening on our doorstep, we decided to go and help with the offloading. Little did we know, that these guys are arriving for a month, and will be repairing stuff and laying new floor. Soon, Michal felt like at his own work and the pile of random stuff grew next to our hut. In the end, we were invited to stay in one of the houses by its owner, who’s mother happens to be Frederic’s cousin. In the past there were several families living here, but like elsewhere, some decided to go as life was very harsh. When only six families were left, life became unsustainable, and in the summer of 1946 the remaining six left. Today, those, whose ancestors lived here own the land, and can come and build houses. However the number of those is limited, and for this bay, it’s only nine. Tonight, in this bay there would be three guys, two dogs and us staying. The sleeping plan for the day was postponed, we allowed some time for the guys to settle in and repair their motors to fetch the stuff before moving in. 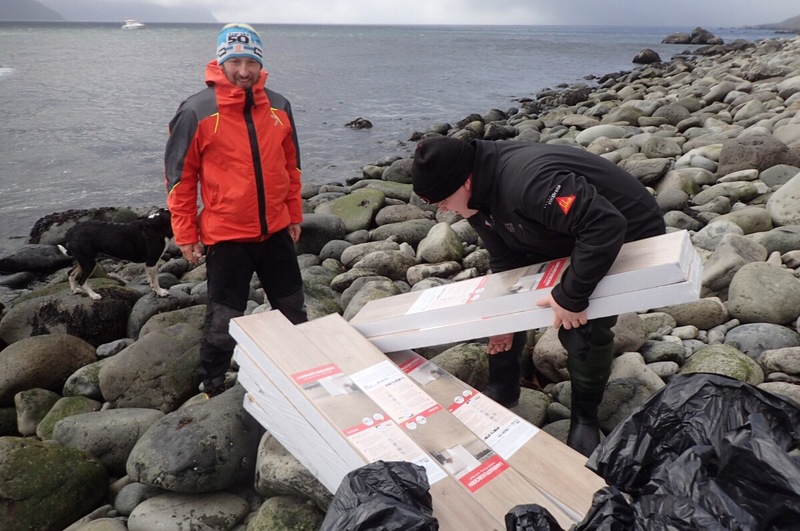 Later, we helped to unpack and stack the new flooring for it to be ready. Now, we just have to wait for the weather to turn in our favour again. Hope it won’t be days.